TORONTO--(Marketwire - Feb 19, 2013) - Where a couple says "I do" is one of the most important elements of a wedding. In addition to elegant event space, top-notch service, creative custom catering and a desirable location, the Toronto Marriott Downtown Eaton Centre Hotel is offering couples a little extra incentive to hold their big day at its wedding venue in Toronto. By hosting a wedding reception at this Toronto luxury hotel, brides and grooms can earn up to 250,000 Marriott Rewards® points, redeemable at more than 3,700 Marriott® hotels worldwide. Put the points toward a luxurious week-long honeymoon, a golf or ski getaway, fine dining, relaxing spa treatments, resort activities and many other indulgent Marriott experiences. The hotel will handle the enrollment of any new Marriott Rewards members so that they may be eligible for this exciting promotion. For more information, visit www.MarriottCanadaWeddings.com. With more than 180,000 sq. ft. of event space, this downtown hotel is the perfect wedding and reception venue, from an intimate soiree to a celebration with a guest list to fill the 7,952-sq.-ft. Grand Ballroom. A 4,000-sq.-ft. foyer is the ideal setting for cocktail hour, and the award-winning culinary team will work with you to ensure the menu is as personal as the celebration. Wow guests with live-action chef stations and indulge their sweet tooth with decadent desserts. Offer your guests options with an internationally inspired dinner buffet, or set the scene with a plated dinner. This hotel's professional event planners are on hand to handle every detail, and an expert audiovisual team can help add personal touches to a wedding or reception. The city of Toronto has a lot to offer, whether visitors are in town for business or play -- the same can be said about the Toronto Marriott Downtown Eaton Centre. With a central location, stylish accommodations, fine dining and generous amenities, this downtown hotel is a destination for working and vacationing guests alike. Directly connected to the Eaton Centre shopping complex via an indoor walkway, this hotel also puts guests within walking distance of other area highlights including Rogers Centre, University of Toronto and Dundas Square. Accommodations are spacious and modern with high-speed Internet access, a desk with ergonomic chair, plug-in panel, 32-inch LCD TV, coffee/tea service and luxurious featherbeds with designer duvets and down comforters. Concierge-level rooms include 50% more space and additional amenities. Sample the creations of Marriott International's 2010 Chef of the Year Morgan Wilson at Trios Bistro; enjoy custom cocktails overlooking historic Trinity Square before or after dinner at the elegant bar. Stay fit at the state-of-the-art health club or the 18th-floor pool with breathtaking views. More than 18,000 sq. 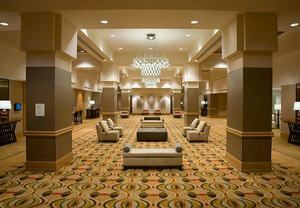 ft. of event space is available for weddings, meetings, corporate functions and celebrations. By hosting a wedding reception at this Toronto Luxury Hotel, brides and grooms can earn up to 250,000 Marriott Rewards(R) points, redeemable at more than 3,700 Marriott(R) hotels worldwide.